just like the transaction provided by sqlalchemy. If some concurrent write happens at the step (2), the data will be overwritten after and the concurrent written data is definitely lost. I tested this situation with etcd-driver and the problem described above really happened. If concurrent writing to the same key when a certain operation is conducted, the value of that key is corrupted. I suggest to define a set of transaction interfaces at db-api layer and enforce all the db-backend driver to follow the rules. Then, rewrite nb-api to do transactions at every operation. Pros: it is straightforward and does not need to introduce other mechanism. Cons: need to modify the db-api layer and nb-api layer, along with all the db drivers. Introduce DLM for nb-api layer. The distributed lock is to solve such a synchronization problem. The only problem is that DLM also needs a distributed coordination backend, like etcd or zookeeper. We need to share the same backend for these two distinct purposes. Pros: separate the responsibility of synchronization from db-api to external system, so don't need to modify db-api and db-drivers. Cons: introduce the external system to implement synchronization. Introduce a compare-and-swap atomic operation in db-api and implements it in all the db-drivers. or maybe its wrong modeling of our DB. that you saw this happens? I am also moving priority for this to High, because if there is a race its problematic. 4. 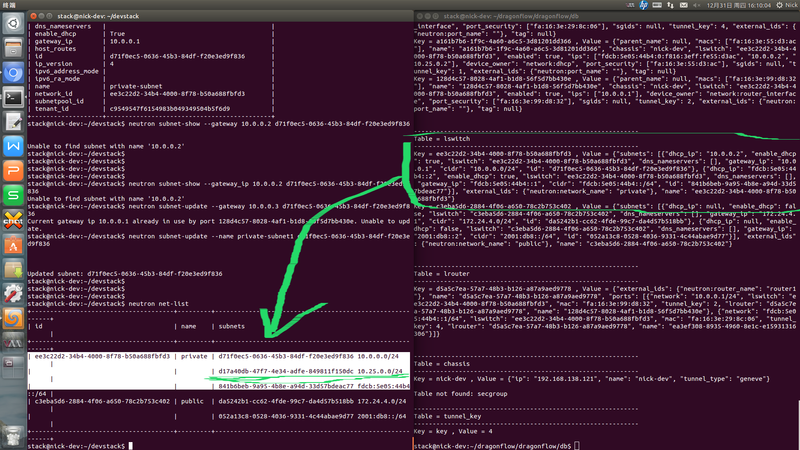 The created subnet is recorded in neutron DB, but lost in Etcd. I'll attach the screen snapshot for demenstration. The scenario happens randomly for bulk operation on subnets, especially for multi-process & multi-worker environment, but it cannot be reproduced every time. So, I did a trick on code to demonstrate it. This also seems related to DB consistency.